The attic and crawl spaces are the most exposed parts of any house and are very susceptible to moisture, mold and bacteria – all of which may lead to serious health issues, especially among those with a weaker immune system, such as infants and the elderly. The lack of air flow and light along with poor insulation, are some of the main reasons and catalysts for the above mentioned problems, and for others. 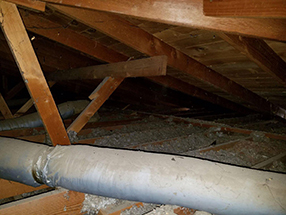 At Air Duct Cleaning Santa Clarita we believe that a healthy home starts with a clean and dry attic and crawl space, which we help our customers achieve with our custom made services and solutions. Before installing new insulation, it is extremely important to remove all previous materials. Once the worn-out material is removed, it is also important to thoroughly clean the area with proper sanitizing solutions meant for this purpose. This way, the area will be ready for the new insulation installation and it will make the whole process as smooth and as effective as it can possibly be. It's important to understand that there may be bacteria that aren't visible to the naked eye, making professional cleaning and sanitization necessary. Crawl Spaces Need to be Checked Too! The crawl space is also a sensitive area of the house that easily affects other parts and that must be kept clean throughout the year (or years). Since many homeowners find it hard to tend to their crawl space on their own, our team offers professional crawl space cleaning services to help you keep your house in a healthy condition and safer for both you and your family. An alarming percentage of houses also serve as home to uninvited rodents. Rodents bring with them numerous problems, starting with malodor and ending with serious health related threats. Our experts offer an additional service to improve the quality of life at your home - rodent proofing. If the insulation at your home wasn't efficient lately (or ever), it is safe to assume that at some point these tiny, little animals invaded your home, leaving their microbes and bacteria lying around. This is a health hazard waiting to happen – so it is best to treat it as soon as possible. There are coutless benefits to having a clean and well insulated attic. If you're in need of professional attic insulation at your home – call our team of technicians! Our team will make sure your property is as clean and safe as it was before the insulation installment begins, scratching one concern off your busy mind!